For other uses, see Essex (disambiguation). 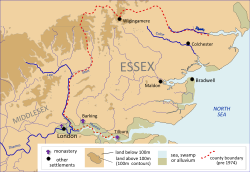 The kingdom of the East Saxons (Old English: Ēast Seaxna Rīce; Latin: Regnum Orientalium Saxonum), today referred to as the Kingdom of Essex /ˈɛsɪks/, was one of the seven traditional kingdoms of the Anglo-Saxon Heptarchy. It was founded in the 6th century and covered the territory later occupied by the counties of Essex, Hertfordshire, Middlesex and (for a short while) Kent. Kings of Essex were frequently subservient to foreign overlords. The last king of Essex was Sigered and in 825, he ceded the kingdom to Ecgberht, King of Wessex. 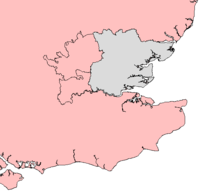 A map showing the outline of those parts now adjacent to the traditional county of Essex (in grey), but which historians postulate were part of the ancient Kingdom of Essex before becoming detached during the middle of the 8th century. The kingdom was bounded to the north by the River Stour and the Kingdom of East Anglia, to the south by the River Thames and Kent, to the east lay the North Sea and to the west Mercia. The territory included the remains of two provincial Roman capitals, Colchester and London. The early kingdom included the land of the Middle Saxons, later Middlesex, most if not all of Hertfordshire and may at times have included Surrey. For a brief period in the 8th century, the Kingdom of Essex controlled what is now Kent. The modern English county of Essex maintains the historic northern and the southern borders, but only covers the territory east of the River Lea, the other parts being lost to neighbouring Mercia during the 8th century. In the Tribal Hidage it is listed as containing 7000 hides. Although the kingdom of Essex was one of the kingdoms of the Heptarchy, its history is not well documented. It produced relatively few Anglo-Saxon charters and no version of the Anglo-Saxon Chronicle; in fact the only mention in the chronicle concerns Bishop Mellitus. As a result, the kingdom is regarded as comparatively obscure. For most of the kingdom's existence, the Essex king was subservient to an overlord - variously the kings of Kent, Anglia or Mercia. Saxon occupation of land that was to form the kingdom had begun by the early 5th century at Mucking and other locations. A large proportion of these original settlers came from Old Saxony. According to British legend (see: Historia Brittonum) the territory known later as Essex was ceded by the Britons to the Saxons following the infamous Treachery of the Long Knives, which occurred ca. 460 during the reign of High King Vortigern. Della Hooke relates the territory ruled by the kings of Essex to the pre-Roman territory of the Trinovantes. Essex emerged as a single kingdom during the 6th century. The dates, names and achievements of the Essex kings, like those of most early rulers in the Heptarchy, remain conjectural. The historical identification of the kings of Essex, including the evidence and a reconstructed genealogy are discussed extensively by Yorke. The dynasty claimed descent from Woden via Seaxnēat. A genealogy of the Essex royal house was prepared in Wessex in the 9th century. Unfortunately the surviving copy is somewhat mutilated. At times during the history of the kingdom several sub-kings within Essex appear to have been able to rule simultaneously. They may have exercised authority over different parts of the kingdom. The first recorded king, according to the East Saxon King List, was Æscwine of Essex, to which a date of 527 is given for the start of his reign, although there are some difficulties with the date of his reign, and Sledd of Essex is listed as the founder of the Essex royal house by other sources. The Essex kings issued coins that echoed those issued by Cunobeline simultaneously asserting a link to the first century rulers while emphasising independence from Mercia. The tomb of Sæbbi of Essex (r.664-683) was visible in Old St Paul's Cathedral until the Great Fire of London of 1666 when the cathedral and the tombs within it were lost. The earliest English record of the kingdom dates to Bede's Historia ecclesiastica gentis Anglorum, which noted the arrival of Bishop (later Saint) Mellitus in London in 604. Æthelberht (King of Kent and overlord of southern England according to Bede) was in a position to exercise some authority in Essex shortly after 604, when his intervention helped in the conversion of King Saebert of Essex (son of Sledd), his nephew, to Christianity. It was Æthelberht, and not Sæberht, who built and endowed St. Pauls in London, where St. Paul’s Cathedral now stands. Bede describes Æthelberht as Sæberht’s overlord. After the death of Saebert in AD 616, Mellitus was driven out and the kingdom reverted to paganism. This may have been the result of opposition to Kentish influence in Essex affairs rather than being specifically anti-Christian. The kingdom reconverted to Christianity under Sigeberht II the Good following a mission by St Cedd who established monasteries at Tilaburg (probably East Tilbury, but possibly West Tilbury) and Ithancester (almost certainly Bradwell-on-Sea). A royal tomb at Prittlewell was discovered and excavated in 2003. Finds included gold foil crosses, suggesting the occupant was Christian. If the occupant was a king, it was probably either Saebert or Sigeberht (murdered AD 653). It is, however, also possible that the occupant was not royal, but simply a wealthy and powerful individual whose identity has gone unrecorded. Essex reverted to Paganism again in 660 with the ascension of the Pagan King Swithelm of Essex. He converted in 662, but died in 664. He was succeeded by his two sons, Sigehere and Sæbbi. A plague the same year caused Sigehere and his people to recant their Christianity and Essex reverted to Paganism a third time. This rebellion was suppressed by Wulfhere of Mercia who established himself as overlord. Bede describes Sigehere and Sæbbi as "rulers … under Wulfhere, king of the Mercians". Wulfhere sent Jaruman, the bishop of Lichfield, to reconvert the East Saxons. Wine (in 666) and Erkenwald (in 675) were appointed bishops of London with spiritual authority over the East Saxon Kingdom. Although London (and the rest of Middlesex) was lost by the East Saxons in the 8th century, the bishops of London continued to exert spiritual authority over Essex as a kingdom, shire and county until 1845. Despite the comparative obscurity of the kingdom, there were strong connections between Essex and the Kentish kingdom across the river Thames which led to the marriage of King Sledd to Ricula, sister of the king, Aethelbert of Kent. For a brief period in the 8th century the kingdom encompassed the Kentish Kingdom to the South. During this period, Essex kings were issuing their own sceattas (coins), perhaps as an assertion of their own independence. However, by the mid 8th century much of the kingdom, including London, had fallen to Mercia and the rump of Essex, roughly the modern county, was now subordinate to the same. After the defeat of the Mercian king Beornwulf around AD 825, Sigered, the last king of Essex, ceded the kingdom which then became a possession of the Wessex king Egbert. The Mercians continued to control parts of Essex and may have supported a pretender to the Essex throne since a Sigeric rex Orientalem Saxonum witnessed a Mercian charter after AD 825. During the ninth century, Essex was part of a sub-kingdom that included Sussex, Surrey and Kent. Sometime between 878 and 886, the territory was formally ceded by Wessex to the Danelaw kingdom of East Anglia, under the Treaty of Alfred and Guthrum. After the reconquest by Edward the Elder the king's representative in Essex was styled an ealdorman and Essex came to be regarded as a shire. The following list of kings may omit whole generations. 798 to 812 Sigered Son of Sigeric. Mercia defeated by Egbert of Wessex, sub-kingdom of Essex subsumed into Wessex; from 812 to about 825 held it only as dux. ^ Keightley, Thomas (1842). The History of England: In two volumes. Longman. ^ a b c Yorke, Barbara (2002). Kings and Kingdoms of Early Anglo-Saxon England. Routledge. pp. 47–52. ISBN 978-1-134-70725-6. ^ Baker, John T. (2006). Cultural Transition in the Chilterns and Essex Region, 350 AD to 650 AD. Univ of Hertfordshire Press. p. 12. ISBN 978-1-902806-53-2. ^ Campbell, James, ed. (1991). The Anglo-Saxons. Penguin. p. 26. ^ Yorke, Barbara (1985). "The Kingdom of the East Saxons". In Clemoes, Peter; Keynes, Simon; Lapidge, Michael (eds.). Anglo-Saxon England 14. Cambridge University Press. pp. 31–36. ^ Yorke, Barbara (1985). "The Kingdom of the East Saxons". In Clemoes, Peter; Keynes, Simon; Lapidge, Michael (eds.). Anglo-Saxon England 14. Cambridge University Press. p. 14. ^ Hooke, Della (1998). The Landscape of Anglo-Saxon England. Leicester University Press. p. 46. ^ a b Yorke, Barbara (2002). Kings and Kingdoms of Early Anglo-Saxon England. Routledge. p. 54. ISBN 978-1-134-70725-6. ^ a b c Hooke, Della (1998). The Landscape of Anglo-Saxon England. Leicester University Press. p. 47. ^ Yorke, Barbara (1985). "The Kingdom of the East Saxons". In Clemoes, Peter; Keynes, Simon; Lapidge, Michael (eds.). Anglo-Saxon England 14. Cambridge University Press. pp. 1–36. ^ Yorke, Barbara (1985). "The Kingdom of the East Saxons". In Clemoes, Peter; Keynes, Simon; Lapidge, Michael (eds.). Anglo-Saxon England 14. Cambridge University Press. p. 3. ^ Yorke, Barbara (1985). "The Kingdom of the East Saxons". In Clemoes, Peter; Keynes, Simon; Lapidge, Michael (eds.). Anglo-Saxon England 14. Cambridge University Press. p. 16. ^ Metcalf, DM (1991). "Anglo-Saxon Coins 1". In Campbell, James (ed.). The Anglo-Saxons. Penguin. pp. 63–64. ^ Stenton, Anglo-Saxon England, p. 109. ^ Kirby, The Earliest English Kings, p. 114. ^ Bede, HE, III, 30, pp. 200–1. ^ Rippon, Stephen. "Essex c.700 - 1066". In Bedwin, O (ed.). The Archaeology of Essex, proceedings of the Writtle conference. p. 117. ^ Brooke, Christopher Nugent Lawrence; Keir, Gillian (1975). London, 800-1216: the shaping of a city. University of California Press. p. 18. ^ Swanton, Michael, ed. (1996). The Anglo-Saxon Chronicles. Phoenix Press. p. 60. ^ "Sigeric 4". Prosopography of Anglo-Saxon England. Retrieved 2016-01-29. ^ Hart, Cyril (1987). "The Ealdordom of Essex". In Neale, Kenneth (ed.). An Essex Tribute. Leopard's Head Press. p. 62. Carpenter, Clive. Kings, Rulers and Statesmen. Guinness Superlatives, Ltd.
Ross, Martha. Rulers and Governments of the World, Vol. 1. Earliest Times to 1491. ‡ Also monarch of Wessex, Kent, Sussex and Mercia.